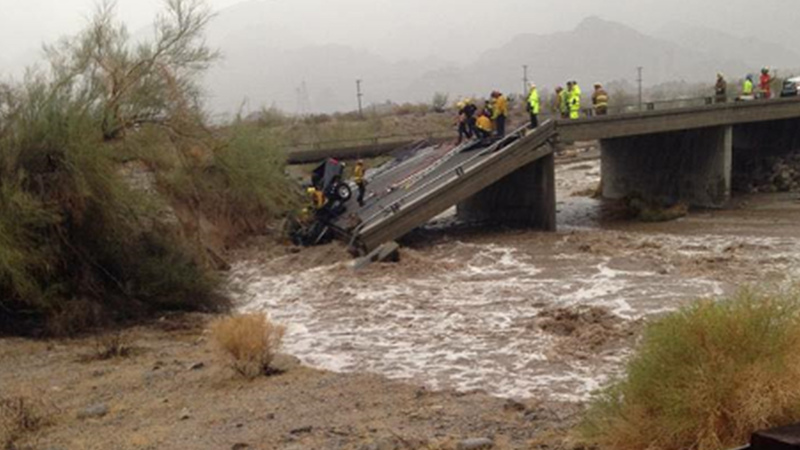 A 30-foot section of a bridge on the 10 Freeway in Desert Center east of Coachella collapsed Sunday, closing Interstate 10 indefinitely. DESERT CENTER, Calif. (KABC) -- A 30-foot section of a bridge on the 10 Freeway in Desert Center east of Coachella collapsed Sunday, closing Interstate 10 indefinitely. The 10 Freeway was shut down from Desert Center to the Arizona state line as a result of the bridge collapse and heavy flooding, authorities said. "This is the major thoroughfare, absolutely, between the Palm Springs area and the Arizona border," said Mike Radford from the California Highway Patrol. "It's going to be closed for a long time." Firefighters responded at about 4:40 p.m. to the eastbound 10 Freeway east of Eagle Mountain Road to rescue a trapped driver, Riverside County fire officials said. The driver was freed after nearly two hours and taken to Desert Regional Medical Center in Palm Springs with moderate injuries. A passenger made it out earlier in the day. Caltrans officials said the underlying Tex Wash that runs under the freeway flooded about 40 feet of the roadway on the 10 Freeway. An eastbound section of the freeway had fallen in. Tap to watch on News app. Structural engineers assessed the damage on Monday. The 10 Freeway will remain closed until further notice. The closure severs a major transportation artery between Los Angeles and Phoenix. The Riverside County Board of Supervisors estimates 40 percent of goods shipped through the country pass through the corridor. On Monday, the governing body declared a local state of emergency. The transportation department says the bridge, which was built in 1967, recently passed inspection on March 17. Caltrans crews are accessing bridges along a 30-mile stretch of the interstate. The westbound bridge near the collapse showed signs of damage, which could further delay the reopening of the highway. Those traveling from Arizona should take Arizona Route 95 to Interstate 40 or Interstate 8 to State Route 111 to Route 86 to access Interstate 10. State Routes 177 and 78 are also closed due to flooding. City News Service contributed to this report. A 30-foot section of a bridge above the 10 Freeway in Desert Center east of Coachella collapsed Sunday, trapping a truck driver.